The most expansive explosion of innovative activity in federal acquisition in a quarter century is now underway. The surge is being driven, in part, by accelerating information technology innovation and disruptive business models in the consumer and business services sectors of the economy. Keeping up requires new approaches that seek to take full advantage of the new capabilities and opportunities while mitigating technical and business risks by making sound acquisition decisions that realize the intended behavior in the regulations. Initiatives currently underway include nearly all major buying organizations. 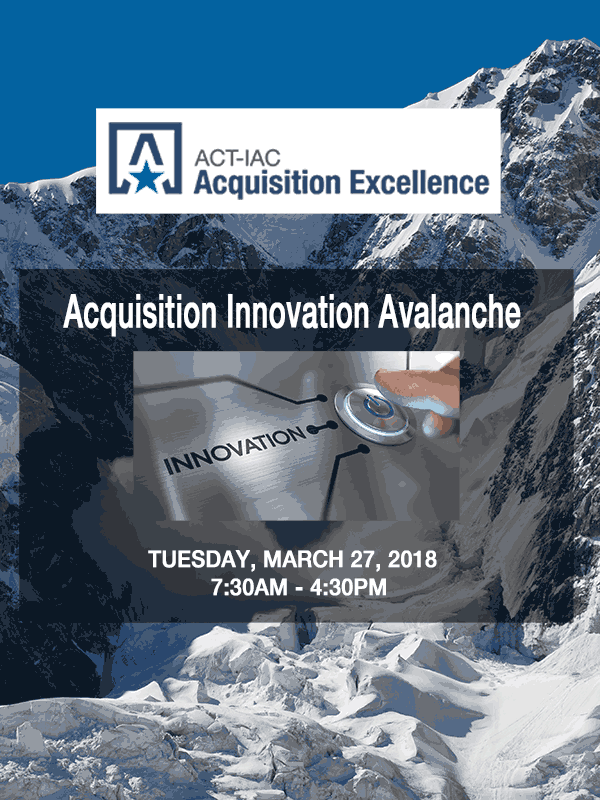 The theme of this year's Acquisition Excellence Conference was Acquisition Innovation Avalanche. Acquisition innovation and technological innovation are two sides of a single coin – with each playing a role in the other. Diffusion of successful innovations in acquisition enable faster and better outcomes for missions across the government. ACT-IAC events are intended to provide an objective and vendor-neutral collaborative environment where government and industry can work together on issues of mutual interest and forge relationships based on trust. Attendees are requested to avoid using this forum for business development purposes. How Other Transaction Authority Got Hot! Where is AE 2018 Being Held This Year? Cancellations made before February 26, 2018, will receive a full refund. Registration fees are non-refundable after February 26, 2018. Substitutions can be made at no charge. No shows will be charged the full registration fee. Cancellation requests must be submitted in writing to membersupport@actiac.org; request for cancellations will not be accepted via telephone. Session Description: Leaders of acquisition teams are creating environments of experimentation with innovative acquisition solutions. Industry has taken notice and the workforce is joining the movement. Despite a growing number of success stories made possible through acquisition innovation, progress is slow and uneven, and largely limited to certain pockets within agencies. Agencies continue to struggle with how and when to test ideas, and many continue to view testing as a “nice to have” that is pursued only when you have the time and only if you are prepared to take on heightened risk. In this session, senior executives, contracting officers, acquisition innovation advocates, and representatives of industry will explore the role of testing in the federal acquisition system. The discussion will include: common perceptions -- and misperceptions -- about testing: whether it is any riskier than everyday work, how industry views testing, whether the results of testing can be scaled, and whether management and the workforce have any real incentive to test. Upcoming opportunities for testing new ways of doing business will be discussed as well. Session Description:Advances in procurement automation are changing how the government buys. During this session, you will find out how advances like robots, artificial intelligence, and Blockchain work, how they are affecting contracting, and what they mean for federal acquisition. Learn first-hand from the federal experts in applying these leading-edge technologies, to procurement-. How are they taking the drudgery out of routine tasks, driving improved strategies, and freeing contracting officers to perform more strategic work? Session Description: Gone are the days where the federal government spends months or years writing down all their requirements for a potential software development effort, then requesting companies to submit long written proposals with their approach and price for delivering and meeting those requirements OR are those days really behind us. Over the past two years we have seen a rise of federal acquisition disruptors such as USDS and 18F changing the way the federal government thinks about their purchases, especially their IT spend. Agencies such as DHS or GSA have used the “show me” verses “tell me” approach for several requirements. An approach where the award may be based on excellence in displaying working software verses writing a lengthy proposal. During this session, we will hear from several federal acquisition innovators/disruptors that chose the "show, don't tell" acquisition strategy approach. The ‘show me’ approach can take on many forms that we want to highlight. Each of our panelists utilized a different approach for recent requirements. This panel will also serve as Judges for the competition portion of this session. Attendees will be split into multiple teams and provided a scenario/requirement for their acquisition challenge. Each team will have the opportunity to present their “innovative” acquisition solution for their given scenario to the panel of judges. An award will be made to the team with the most innovative acquisition approach. Session Description: Most federal acquisition laws and rules don't apply to the Other Transaction Authority agreements (OTAs) that 11 departments and agencies now are allowed to use. That leaves lots of room for customizing to attract novel solutions from companies that don't traditionally work with government. At DoD alone, the use of OTAs doubled from 2015 to 2016 and grew another nearly 50 percent the next year. Defense organizations executed more than $2 billion in OTAs in 2017. Just last month, with the help of the Defense Innovation Unit Experimental (DIUx), DoD awarded a $950 million cloud migration contract using an OTA. Come hear how your peers are improvising to entice innovators! Define and explain how OTAs work. Session Description: The implementation of category management across government impacts both its acquisition workforce and industry stakeholders. This session is an opportunity to learn about the current state of category management implementation, what the areas of focus for category management are in the coming year, and how several agencies have leaned forward to leverage category management principles to innovate and improve their agencies mission delivery. Most importantly, this session will provide an opportunity for discussion on the challenges, benefits, and impacts of this foundational shift in how government approaches better managing its spend and industrial base. Session Description:The Report to the President on Federal IT Modernization lays out a challenging blueprint to not only modernize technology but transform the way government operates. Key to delivering on this promise are innovative acquisition strategies, initiatives, policies, and vehicles. First, learn from experts who contributed to the report about the role of acquisition in transforming the technological landscape. Second, hear from industry about their perspectives, concerns, and how they envision industry collaborating in this challenging environment. Session Description: Section 846 of the 2018 NDAA includes a requirement for the government to consider and plan for the implementation of Commercial e-Commerce Portals. In January, GSA conducted a modified town hall style meeting to garner inputs from a variety of stakeholder perspectives. GSA and OMB have specific responsibilities under the law to study and plan for the implementation of portals in the federal government. Meanwhile, US Communities has led the way in implementing an “Online Marketplace for the Purchases of Products and Services” for the State and Local public sector. Prince William County Public Schools is the lead agency for the contract. The panelists will provide different perspectives on the e-marketplace environment. Panelists include a representative from US Communities, a large public-sector cooperative buying entity currently using a e-marketplace platform, a large corporation with enterprise procurement processes, commercial market platforms providing insight on buy-side and sell-side marketplaces, and a federal government ordering activity approach. o How do you balance retail shopping experience with enterprise buying practices? o How will the e-Marketplace be good for small business? o How might this transformation support improved supply chain visibility / risk management? Courtney H. Bailey, Associate General Counsel, Commercial and Intellectual Property Law, NASA Headquarters. Courtney H. Bailey is the NASA Associate General Counsel for Commercial and Intellectual Property Law. She provides policy and legal guidance on space commercialization, domestic partnerships, innovation initiatives, intellectual property, technology transfer and communication/outreach. Courtney spent over a decade in private and in-house legal practice prior to joining NASA in 2006, specializing in matters relating to technology marketing and acquisition, venture capital investment, and corporate mergers. Courtney received her J.D. from Hastings College of Law in San Francisco, her B.A. from the University of Texas at Austin, and attended the LL.M. program in Intellectual Property at the George Washington University School of Law. Mathew Blum, Associate Administrator, Office of Federal Procurement Policy, Office of Management and Budget. Mathew Blum manages the development of legislation, regulations, policies, and other resources to promote sound acquisition practices. His branch is responsible for facilitating the use of innovative buying practices to support IT modernization and other priority initiatives. In 2017, Mr. Blum was elected as a Fellow into the National Academy of Public Administration and received the John J. Franke Award, bestowed by ACT-IAC to a government employee who has made extraordinary and long-term contributions to creating a more effective, innovative and responsive government. Steven M. Brady, Branch Chief, Enterprise Innovation Support, Air Force Installation Contracting Agency (AFICA). As Chief of the Enterprise Innovation Support Branch Mr. Steven Brady leads a team of program management (PM), contracting, operations research, IT and change management specialists. He established the Category Management (CM) Program Support Office (PSO), responsible for providing support resources and execution tactics for the Air Force's $119B CM program; and specializing in Category intelligence Report (CIR) workshops to train teams to effectively use business intelligence to improve organizational cost performance. Steve has 20 years of industry experience, having led projects for Motorola and Northrop Grumman. He also co-authored the PM book, How to Save a Failing Project: Chaos to Control. Kenneth M. Brennan, Reform Lead, Services Contracts and Category Management, CMO, Department of Defense. Mr. Ken Brennan is currently the Reform Lead for Services Contracts and Category Management within the Office of the Chief Management Officer (CMO). One of nine reform teams created by the Deputy Secretary of Defense to improve the business functions of the Department (DoD), Mr. Brennan is leading cross functional initiatives across the DoD to improve the quality, productivity and cost of contracted services and goods. He is leading the development of new and improved governance structures, processes, and policies for executing services acquisition and category management (CM) in the Military Departments and Defense Agencies. Mr. Brennan is also the DoD Senior Accountable Official for the Federal CM. His previous assignment, from May 2013 to October 2017, was Deputy Director for Services Acquisition in the office of Defense Procurement and Acquisition Policy, where he was responsible for the technical and programmatic evaluation and functional oversight of all aspects of DoD services acquisition. He was responsible for ensuring compliance with policies governing defense acquisition of services as well as for review and analysis of services programs execution and services industrial base issues. From May 2006 to April 2013, he was in the office of the Deputy Assistant Secretary of the Navy (Acquisition & Procurement), responsible for establishing policy and oversight of the Department of Navy (DON) services acquisition. He was also responsible for Acquisition Program assessments, providing management and technical expertise for the implementation, management and operation of the DON acquisition system. In 1988 Mr. Brennan earned a Bachelor of Science degree in Mechanical Engineering from Rose-Hulman Institute of Technology, Terre Haute, IN, and in 2007 a Masters of Public Affairs at Indiana University in Bloomington, IN. Mr. Brennan began his federal service in 1988 at the Naval Surface Warfare Center, Crane Division (Crane, Indiana) as a mechanical engineer on the Trident Test and Measurement Equipment project supporting Strategic Systems Programs. Also at Crane Mr. Brennan was project lead and supervisor for the Crane Division’s Metrology and Calibration project, and manager of the Rechargeable Electro-Chemical Power Systems Assessment Branch. In 2001, Mr. Brennan relocated to the Naval Sea Systems Command (NAVSEA) in Washington, DC, completing developmental assignments at the Joint Maritime Command and Control Capability program; at the Atlantic Fleet; on the staff of the Deputy Chief of Naval Operations; and in the Warfare Center Business Executive Office. Mr. Brennan was also the acting Deputy Supervisor of Shipbuilding, Conversion and Repair (SUPSHIP), Pascagoula, MS. In 2004, Mr. Brennan became the SUPSHIP Plans, Programs and Resources Division Director at NAVSEA, responsible for the SUPSHIP community’s financial and workforce budget and policies. Mr. Brennan is a member of the Acquisition Professional Community, certified at DAWIA career level III in both Program Management and Business, Cost Estimating and Financial Management. Mr. Brennan was awarded the Navy Meritorious Civilian Service Award in 2003, the Navy Superior Civilian Service Award in 2012, and the Secretary of Defense Meritorious Civilian Service Award in 2017. Jeffrey Chance, Contract Specialist, FEDSIM, General Services Administration. For nearly 10 years, he has worked for GSA in procurement, managing complex acquisitions and providing innovative solutions to Government clients. Jeffrey earned his B.B.A. in Business Management from Howard University and possesses a Master Certification in Contract Management. Eric Cho, Project Lead, DHS Procurement Innovation Lab. Eric Cho is the project lead for the DHS Procurement Innovation Lab (PIL), a DHS Office of the Chief Procurement Officer-sponsored initiative aimed at experimenting with innovative techniques for increasing efficiencies in the procurement process. Eric also serves the role as the Acquisition Innovation Advocate for DHS. Eric previously served as a DHS detailee on the House Committee on Oversight and Government Reform (2012–2015). Eric’s former roles include director of acquisition operations at GSA/FAS Integrated Technology Services (2011–2012), detailee on the Senate Committee on Homeland Security and Governmental Affairs (2008–2010), and staff for the Acquisition Advisory (a.k.a. Services Acquisition Reform Act, SARA) Panel (2005–2007). Before joining the government, he was director of operations at an Internet start-up in Southern California that specialized in MP3 and streaming media. He is a graduate of the University of California at Berkeley and the George Washington University Law School and a member of the Virginia and District of Columbia bars. Alan Chvotkin Esq., Executive Vice President and Counsel, Professional Services Council. Alan is executive vice president and counsel of the Professional Services Council, the principal national trade association of the government technology and professional services industry, where he is responsible for PSC’s legislative and regulatory policy activities. Prior to joining PSC, he was vice president of AT&T Government Services and was a professional staff member on Capitol Hill for 13 years. He is a member of the American, Supreme Court and District of Columbia Bar Associations, and a fellow of the National Contract Management Association. He also holds a master’s in public administration and a bachelor’s in political science. Soraya Correa, Chief Procurement Officer, Department of Homeland Security. Soraya Correa was appointed as the Department of Homeland Security’s (DHS) Chief Procurement Officer in January 2015. Since then, she has initiated and led several key efforts designed to improve how the 1,400 member DHS procurement workforce focuses as a team on finding the right solutions to enable and support the DHS mission. These efforts include the Acquisition Innovations in Motion (AIiM) framework, including the Procurement Innovation Lab (PIL), and the Education, Development, Growth, and Excellence (EDGE) mentoring program. Additionally, Ms. Correa has continued to grow and enhance efforts including the Homeland Security Acquisition Institute, the Acquisition Professional Career Program, the Strategic Sourcing Program Office, and Office of Small and Disadvantaged Business Utilization. In her capacity as the Senior Procurement Executive, Ms. Correa oversees the work of nine Heads of Contracting Activity that provide operational procurement services to DHS components, directorates, and offices. She also supports the Chief Acquisition Officer in providing leadership of the 12,800 member acquisition workforce. Her office leads acquisition policy; oversight; and workforce career development, training, and certifications. Prior to being appointed as the DHS Chief Procurement Officer, Ms. Correa served as the Associate Director of the U.S. Citizenship and Immigration Services Enterprise Services Directorate and was responsible for delivering identity, immigration status, and employment authorization information in support of the agency’s mission. Ms. Correa has also held key leadership positions at federal agencies including the Naval Sea Systems Command, General Services Administration, National Aeronautics and Space Administration, and Immigration and Naturalization Service. Her accomplishments as a leader are well recognized by the government and industry communities. She has received awards including the Secretary’s Award for Excellence, Management Support Awards, Federal 100 recognition, Public Sector Partner of the Year, Top Women in Tech, and several other awards that reflect her commitment to the acquisition workforce, procurement innovation, and promoting meaningful communications with industry. Kevin Cox, CDM Program Manager, Network Security Deployment, U.S. Department of Homeland Security. Kevin Cox is the Program Manager for the Continuous Diagnostics and Mitigation (CDM) Program, within the Department of Homeland Security’s Office of Cybersecurity and Communications. In this position, Mr. Cox leads the effort working collaboratively with federal agencies to deploy cybersecurity solutions to 1) identify agency networks and assets and 2) protect them and agency data in near real-time against the growing cybersecurity threats. Prior to joining DHS, Mr. Cox served as the Deputy Chief Information Security Officer (CISO) at the Department of Justice, where he oversaw the organization’s cybersecurity continuous monitoring capabilities and the security posture dashboard. Mr. Cox holds M.A. degrees from West Virginia University and the University of Chicago. Anthony E. Crosby, Administrative Coordinator, Prince William County Schools, VA. Anthony (Tony) E. Crosby retired from Fairfax County Public Schools, serving as Director of the Office of Procurement Services, in December 2012 after 27 years of service. He joined Prince William County Public Schools in January 2013 and is currently serving as the Administrative Coordinator in the Purchasing Office. He is a graduate of Kent State University, with a degree in Business Management and Marketing. Tony has maintained certifications with the National Institute of Governmental Purchasing (NIGP), since 1989, as a Certified Public Purchasing Officer (CPPO) and Certified Professional Public Buyer (CPPB). He also served as a past master instructor for NIGP’s curriculum courses. His career has afforded him the opportunity to currently serve on the US Communities Advisory Board and he formerly served as the representative for the State of Virginia for the Association of Educational Purchasing Agencies cooperative program. Tony genuinely has a passion for public procurement and ensuring organizations ability to be efficient and effective in supporting key stakeholders. Thomas A. Dougherty, Center Director, Army Contracting Command - New Jersey. Thomas Dougherty is the Center Director for the Innovative Concepts Contracting Center in the Army Contracting Command-New Jersey, located at Picatinny Arsenal. Tom oversees a team of Agreements Officers who support the Defense Innovation Unit – Experimental in the award of Other Transaction Agreements to accelerate the development, procurement and integration of commercially-derived capabilities. In addition, Tom has oversight for the ACC-NJ Consortium-based OTAs with the Consortium for Command, Control and Communications in Cyberspace (C5) and the Consortium for Energy, Environment and Demilitarization (CEED). Tom has a Bachelor’s Degree in Economics and Philosophy from Boston College and a Juris Doctorate from the St. John’s University School of Law. Previous Positions: Dave most recently served as Commissioner of the Section 809 Panel and a Director, Government Contracts, Dixon Hughes Goodman, LLP. Prior to joining DHG, Dave served as the Corporate Director of Contracts for Northrop Grumman Corporation, where he previously served as the Corporate Director, Acquisition Policy. Dave also served as the Senior Procurement Executive and Deputy Chief Acquisition Officer of the US General Services Administration (GSA). Dave served as one of the FAR signatories, supervised Federal Acquisition Institute and Integrated Acquisition Environment while at GSA. He served as a detailee to the Senate Homeland Security and Government Affairs Committee while at GSA where he authored S.680. Dave was appointed by the President and served as a member of the Section 1423 (SARA) Panel. He was also appointed and served as a member of the GSA Multiple Award Schedule Advisory Panel. Prior to going to GSA Dave served as the Deputy PM of the Pentagon Renovation, the Assistant Deputy Under Secretary of Defense for Acquisition Reform, and in numerous other positions with the Defense Logistics Agency, the Defense Contract Management Agency and the US Army in CONUS and Europe. Dave’s awards include: NCMA’s Charles A. Dana Distinguished Service Award; Public Sector Partner of the Year Award; the President’s Meritorious Senior Executive Award; the Fed 100 Top IT Executives (x2); AFFIRM’s Leadership Award in Acquisition & Procurement; the Department of Defense Exceptional (x2) and Meritorious Civilian Service Awards (x2); the Defense Logistic Agency’s Meritorious Civilian Service Award; and, the Department of the Army’s Meritorious Civilian Service Award, among others. Michael P. Fischetti, J.D. CPCM, Fellow, CAE, Executive Director, National Contract Management Association. Michael P. Fischetti is the executive director of the National Contract Management Association (NCMA) located in Ashburn, Virginia. In that position, he is chief executive officer (CEO) responsible for managing a professional association representing over 20,000 contracting and acquisition professionals, with over 111 chapters worldwide, an annual budget of approximately $10M, and a professional staff of 30. He manages worldwide conferences, education and certification programs, and various government/industry contract management governance and working groups. He also oversees a variety of publications, including a monthly magazine, a scholarly journal, newsletters, and instructional books and materials. Fischetti was previously a member of the NCMA Board of Directors (2007–2012), serving on a variety of committees, including service as chair of the Professional Standards and Ethics Committee. He served in various roles in the Washington, DC Chapter, including president, vice president, treasurer, director, and chairman. He was deemed an honorary fellow with NCMA in December 1997. Prior to this position, Fischetti was the component acquisition executive (CAE) for the $50B+ Military Healthcare System (MHS), responsible for program management and oversight, acquisition workforce management, and DoD 5000 policy implementation. He was the milestone decision authority for ACAT II and III programs and chaired the Acquisition Management Board as the director of acquisition management and support within the Office of the Assistant Secretary of Defense (Health Affairs)/TRICARE Management Activity (TMA), with full authority and responsibility for acquisition policy, management, oversight, and operations involving the obligation of billions of dollars annually for the DOD medical and dental program and related information systems and technology. Fischetti was the head of contracting activity (HCA), responsible for managing all contracting functions for the healthcare, information technology, and multiple supporting services contracts within TMA. Fischetti previously came to TRICARE from the Department of Energy (DoE), where he was director of their Office of Procurement and Assistance Policy since 2004, responsible for supporting the development of government-wide policy through the FAR Council, managing, developing and issuing guidance to the Department’s FAR supplement, acquisition guide, acquisition letters, and training in all aspects of procurement and the department’s procurement regulatory system. He was appointed to the Federal Senior Executive Service in 2006. Fischetti has over 30 prior years of extensive acquisition experience in management, policy, and contracting officer positions involved with all facets of government and agency policy development and implementation, oversight, program management, and procurement operations of services, weapon systems, and information technology from a variety of government and civilian organizations. He currently is a member of the Procurement Round Table as well as the Senior Advisors to Government Executives Program (SAGE) within the Partnership for Public Service. His formal education includes a Juris Doctor degree, an MS in national resource strategy from the National Defense University (NDU) Industrial College of the Armed Forces (ICAF), an MA in business management from Central Michigan University, and a BA in economics and political science from the State University of New York at Buffalo. He is an American Society of Association Executives (ASAE) Certified Association Executive (CAE), NCMA Certified Professional Contracts Manager (CPCM), FAC-C certified, and has attained Level 3 contracting and program management certifications with DoE and DoD. Dawn Fisher, Director, Spot Buy Adoption, SAP Ariba. Dawn Fisher is currently Director of Spot Buy Adoption at SAP Ariba with over 15 years of B2B E-Commerce experience with primary focus on content management. Dawn has facilitated the adoption of the SAP Ariba Spot Buy eMarketplace innovation to over 50 enterprise customers. Dawn is a huge Philadelphia Eagles fan (Super Bowl LII champs) and currently resides with her family in Lehighton, Pennsylvania. 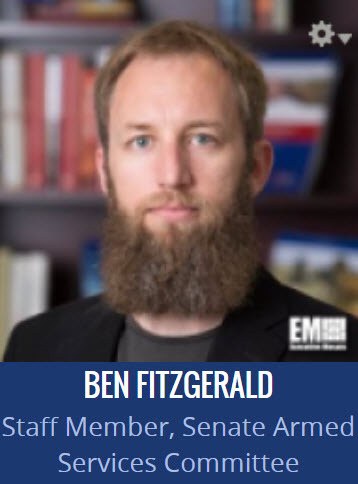 Ben FitzGerald, Director, Office of Strategy and Design, Office of the Secretary of Defense, Department of Defense. Ben FitzGerald, a professional staff member on the Senate Armed Services Committee, has been appointed director of the Defense Department‘s strategy and design office in a move slated to take effect Jan. 2. DoD said FitzGerald will lead the reorganization of the Pentagon’s office of the undersecretary of defense for acquisition, technology and logistics. The National Defense Authorization Act for Fiscal Year 2017 mandates DoD to split up the responsibilities of the AT&L office into between an undersecretary for acquisition and sustainment; an undersecretary for research and engineering; and a chief management officer. FitzGerald will serve for five years as a highly qualified expert, which refers to “individuals who possess uncommon, special knowledge, skills and experience in an occupational field, and judgment that is accorded authority and status by peers or the public,” DoD noted. In his new role, FitzGerald will aim to identify if current AT&L functions should transition to R&E, A&S, another post within the office of the defense secretary, the military services or be eliminated altogether. He previously served as senior fellow and director of the technology and national security program at the Center for a New American Security. FitzGerald also worked as a managing director at consulting firm Noetic Group; a solutions specialist at IBM; and an account manager at Unisys. Will Fortier, Senior Director, Acquisition Life Cycle, E3 Federal Solutions. Director of Acquisition Services for E3 Federal Solutions. He brings 20 years of experience in the areas of budget, acquisition, and program management. He currently serves as program manager for E3’s support to GSA FEDSIM, responsible for end to end business operations support for a portfolio that consists of over 150 contracts and spans across 40 government agencies. Mr. Fortier is a US Army Veteran that brings a unique combination of IT lifecycle program management, government finance, and procurement experience in places including the White House, the FBI, and GSA clients. James Geurts, Assistant Secretary of the Navy for Research, Development, and Acquisition, United States Department of the Navy. 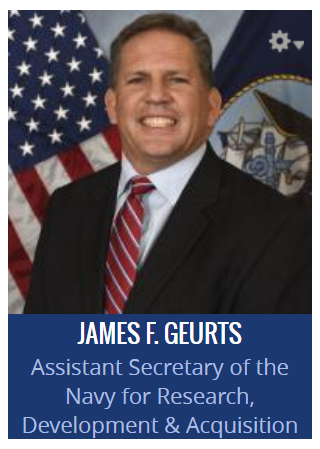 On Dec. 5, 2017, Mr. James F. Geurts was sworn in as Assistant Secretary of the Navy for Research, Development & Acquisition (ASN (RD&A)), following his confirmation by the Senate November 2017. As the Navy’s acquisition executive, Mr. Geurts has oversight of an annual budget in excess of $60 billion and is responsible for equipping and supporting the finest Sailors and Marines in the world with the best platforms, systems and technology as they operate around the globe in defense of the Nation. Greg Giddens, Partner, Potomac Ridge Consulting. Greg recently retired from the Department of Veterans Affairs where he was the Chief Acquisition Officer and lead the VA’s response to OMB memo 17-22 on reforming the executive branch. He served in four different cabinet agencies working in procurement, program management, acquisition, and change management. He is now the co-founder and partner of Potomac Ridge Consulting. Jenn Gustetic, Program Executive for Small Business Innovation Research (SBIR/STTR), NASA Headquarters. The NASA SBIR and STTR programs fund small businesses approximately $200M annually for research, development, and demonstration of innovative technologies that fulfill NASA needs and have significant potential for successful commercialization. She is an experienced innovator and policy entrepreneur, having served as the Assistant Director for Open Innovation at the White House Office of Science and Technology Policy (2014-2016), and a leader in the federal open innovation community, having served as the program executive for prizes and challenges at NASA (2012-2014) and co-chair of the interagency Maker working group (2016-today). She also led NASA’s formulation efforts for its Grand Challenges including the Asteroid Grand Challenge to “find all asteroid threats to human populations and know what to do about them”. Ms. Gustetic holds a bachelors degree in aerospace engineering from the University of Florida and a master’s degree in technology policy from the Massachusetts Institute of Technology. She has published numerous writings on innovation including in Space Policy and Issues in Science and Technology. Outside of her NASA duties, she is also currently a 2018-2019 digital Harvard Kennedy School research fellow focusing on research related to the future of work and a board member for the Van Alen Institute, a non-profit that used design to transform cities, landscapes, and regions to improve people’s lives. Tiffany Hixson, Assistant Commissioner, Office of Professional Services & Human Capital Categories, General Services Administration. Ms. Hixson is the Assistant Commissioner for the Office of Professional Services and Human Capital Categories, an office within the U.S. General Services Administration’s Federal Acquisition Service (FAS). She also serves as FAS’ Northwest-Arctic Region Regional Commissioner and is the governmentwide Professional Services Category Executive, appointed by the Office of Management and Budget in February 2016. In these roles, Ms. Hixson is responsible for strategic leadership, oversight and management of FAS’s professional services, human capital services and charge card management programs and contracts, as well as governmentwide professional services category management. She also supports FAS’ federal agency customers in Alaska, Idaho, Oregon, and Washington with assisted acquisition services, telecommunications, vehicles, and thousands of other goods and services. Ms. Hixson brings more than 29 years of professional experience in the field of acquisition management to the GSA leadership team. She is known for developing entrepreneurial organizations, collaboration, tackling tough challenges, and leading effective contract and program operations. Ms. Hixson began her career in Seattle as an intern with the National Oceanic and Atmospheric Administration and rose through the ranks gaining experience as a contract specialist and procurement analyst before being appointed as the Director for Commerce Acquisition Solutions at the U.S. Department of Commerce. In 2004, she joined the U.S. Department of Homeland Security (DHS). At DHS she led several key acquisition programs and offices including her last as the Deputy Executive Director of U.S. Customs and Border Protection’s (CBP) Procurement Directorate where she led contract operations acquiring technology, construction, facilities management, supplies, and services in support of CBP’s vital border protection mission. Ms. Hixson holds a Masters degree in Public Administration from American University and received her undergraduate degree from Seattle University. She frequently participates in Government-wide forums to discuss the merits of streamlined and innovative acquisition programs, and has coauthored several articles on these and other subjects. She has served as President of the American Society of Public Administration’s National Capital Area Chapter and Chair of the American Council for Technology’s Industry Advisory Council’s Partners leadership development program. Ms. Hixson was appointed to the Senior Executive Service in 2007 and has had notable recognition including the 2016 Fed 100, 2015 Coalition for Government Procurement’s Government Savings Award, 2008 DHS CFO’s Budget, Planning and Execution Award, Commerce’s Bronze and Silver Medal awards, and National Performance Review’s Hammer Award. Ms. Hixson lives in Burien, Washington, with her husband Cory and spends as much time as she can in her home state of Alaska enjoying the great outdoors and time with her extended family. Jay Huie, Director, GSA Technology Transformation Service (TTS) Secure Cloud PortfolioJay Huie has spent over 15 years guiding the evolution and adoption of technology within federal and enterprise environments. His expertise includes bringing a multi-discipline approach to help Agencies achieve their missions. He currently serves as the Director for the GSA Technology Transformation Service (TTS) Secure Cloud Portfolio, which includes the FedRAMP program. The mission of the Secure Cloud Portfolio is to accelerate cloud adoption, build connections between government and industry, as well as build partnerships between the two in service of ensuring Agencies are more effectively able to achieve their missions. Most recently, Jay has been tasked to lead GSA’s Cloud Adoption Center of Excellence supporting the White House Office of American Innovation. In this role, he will build specific capabilities to assist efforts by Federal Agencies to leverage modern technology and cloud services. Jay has had experience as a developer, system administrator, policy wonk, architect, and technology executive. He previously worked at 18F where he enjoyed “balancing traditional and the modern techniques for realizing the results we all hope to have for our nation.” Prior to GSA, Jay was a Chief Technology Officer, working with Agencies such as the Federal Reserve Board, Department of Energy, and Department of State to establish and manage initiatives including data management services, cloud computing infrastructure, and strategic governance through the practical application of enterprise architecture and capital planning and management activities. Holly S. Joers, Chief, Strategic Sourcing, Office of the Deputy Under Secretary of the Air Force, Management. Holly Joers is an Acquisition Program Manager currently serving as the Chief of Strategic Sourcing for Office of the Deputy Under Secretary of the Air Force for Management and Deputy Chief Management Officer. She is responsible for initiation and governance of the Air Force’s Category Management Program aimed at proactively and strategically managing costs. She also has oversight of the Headquarters Air Force contracted support services portfolio, ensuring disciplined governance, performance management, identification of efficiencies and implementation of continuous process improvement activities. Patrick A. Joy, Head of the Contracting Activity, Acquisition Management Services, Program Support Center, U.S. Department of Health and Human Services. Patrick Joy is the head of contracting activity (HCA) for the Program Support Center. Patrick has overall responsibility for managing the contracting activity and overseeing the processing of over $2 billion in contract awards as part of Acquisition Management Services (AMS) within the Financial Management and Procurement Portfolio. AMS is a shared service provider located within the Department of Health and Human Services (HHS). AMS supports all parts of HHS and 32 of the Federal departments and agencies. In FY1, AMS awarded $1.6 billion for HHS and over $700 million dollars in assisted acquisitions primarily for DOD customers. Patrick joined the federal government as a clerk typist in 1989 working in the Administrative Services Center. He served as a contract specialist, contracting officer, and procurement analyst in the acquisition activity for over 20 years. In recent years, he served as a customer liaison to external acquisition customers and then assumed the role of interim HCA in January 2014. Patrick was appointed the permeant HCA in December 2016. During his time as HCA, AMS achieved acquisition excellence with record-breaking award obligations, increased customer satisfaction scores, and an increase in employee morale. Patrick earned a bachelor’s degree in Russian and Soviet history from the University of Maryland, College Park. Lauren Knausenberger, Director, Cyberspace Innovation, Director, AFWERX Spark Tank. Lauren Knausenberger recently joined the U.S. Air Force to drive innovation across the Department of Defense, speed adoption of emerging technologies, and create stronger partnerships between DoD, start-ups, and the venture community. Prior to joining the government, Lauren was founder and President of Accellint, Inc., a consulting firm specializing in solving problems of national security importance and investing in commercial technologies that could be applied to a government mission. An enthusiastic Angel investor, Lauren is active with NextGen Angels, has invested in emerging technology companies, such as Graphene Frontiers, and is now applying the VC model to the Air Force through Spark Tank, a DoD version of the Shark Tank television series. She hold an MBA from the Wharton School of Business, has served as an executive for a large defense contractor, and has extensive experience supporting the intelligence community. Outside of work, Lauren enjoys traveling, trying new cuisine, and chasing two small children. She also recently founded a non-profit that encourages excellence in education at the intersection of Art and STEM. Jeffrey A. Koses, Senior Procurement Executive, General Services Administration. Jeffrey A. Koses is recognized as an innovative leader in the field of acquisition. As Senior Procurement Executive for the General Services Administration, he has three priorities: 1) strengthen the acquisition workforce, 2) smart and effective buying and 3) healthy and productive industry relationships. Jeff and his team are currently developing the tools and strategies to advance these priorities. He also serves as a voting member of the Federal Acquisition Regulatory Council. From 2008 through 2014, Jeff was Director of Acquisition Operations within the Federal Acquisition Service, where he led several Federal Strategic Sourcing Initiatives, created GSA’s premiere vehicle for integrated professional services, OASIS, and managed 25 multiple award schedules with annual sales of over $22 billion, supported emergency acquisition and oversaw acquisition for GSA Global Supply. Prior to that, Jeff directed the Office of Contract Management and played a host of both operational and policy roles. Mr. Koses holds a Bachelor’s degree in History and Political Science from Washington University in St. Louis, MO. He also holds a Master’s degree in Acquisition Management. Jeff Lau, Acting Regional Commissioner, Federal Acquisition Service in the Northeast and Caribbean Region (R2), General Services Administration. Since April 2011, Mr. Lau has been the FAS Deputy Regional Commissioner for the Northeast and Caribbean Region. He is responsible for providing leadership and oversight to four FAS portfolios representing over 120 employees and approximately $2 billion in revenue annually. These portfolios provide procurement and contract solutions to federal customers as well as state and local agencies. Anne Laurent, Strategic Consultant, ASI Government. Anne Laurent is a respected analyst of federal management, especially acquisition and information technology, with more than 30 years of experience. She currently is a thought leadership consultant working with a variety of clients, including Acquisition Excellence co-chairman Tim Cooke. As a subject matter expert with the Consortium for Advanced Management International, she is working on a study deriving lessons for U.S. government from procurement and IT transformation in the U.K.
Anne has been A National Academy of Public Administration fellow since 2000. She was director of strategic initiatives for ASI Government; led defense, aerospace and federal market analysis for Bloomberg Government; served as executive editor of Government Executive magazine; and was senior editor of Federal Times newspaper. Anne also has been director of CGI Federal’s Initiative for Collaborative Government and senior research manager for the Partnership for Public Service. Tonya Lovelace, Contracting Officer, Branch Chief, U.S. Department of Interior, Interior Business Center, Acquisition Services Directorate. Tonya S. Lovelace is a Branch Chief and Contracting Officer with the Department of the Interior, Acquisition Services Directorate. Tonya has been with DOI since August 2005. She previously worked as a Contracting Officer/Contract Specialist for GSA in Kansas City and at Fort Leavenworth KS. Her experience, in addition to Contracting, include2 16 years with the Defense Commissary Agency, where she managed military commissaries worldwide, including two tours in Germany. Tonya is a 1985 graduate of Virginia Commonwealth University in Richmond VA—obtaining her Bachelor of Science in Business (Marketing) and a 2008 Graduate of the University of Maryland University College where she received her MBA. Dr. Douglas Maughan, Ph.D., Division Director, Cyber Security Division in the Homeland Security Advanced Research Projects Agency within the Science and Technology Directorate of the Department of Homeland Security. Dr. Douglas Maughan is the Division Director of the Cyber Security Division within the Science and Technology (S&T) Directorate of the Department of Homeland Security (DHS). Dr. Maughan has been at DHS since October 2003 and is directing and managing the Cyber Security Research and Development activities and staff at DHS S&T. Dr. Maughan has been responsible for helping bring to market over 70 commercial and open-source information security products during the past 14+ years while at DHS and is the Senior Executive responsible for the DHS Silicon Valley Innovation Program. Prior to his appointment at DHS, Dr. Maughan was a Program Manager at the Defense Advanced Research Projects Agency (DARPA). Prior to his appointment at DARPA, Dr. Maughan worked for the National Security Agency (NSA) as a senior computer scientist and led several research teams performing network security research. Dr. Maughan received Bachelor’s Degrees in Computer Science and Applied Statistics from Utah State University, a Masters degree in Computer Science from Johns Hopkins University, and a PhD in Computer Science from the University of Maryland, Baltimore County (UMBC). Thomas J. Martwinski, President and Chief Operating Officer, InScope International. Mr. Martwinski has over 30 years of delivering enterprise solutions to the Federal Government. His experience developing and winning government contracts exceeds $600 million. He has supported IT and National Security projects at DoD, IRS, DoE, FTC, DHS, eBay, and FreddieMac. While at Management Systems Designers, Inc. Mr. Martwinski was responsible for successful delivery of over 40 IT projects for the IRS ranging in value from $50,000 to $10 million programs. Mr. Martwinski has a Master of Science in Information Management and a Master of Business Administration; and is PMP certified. 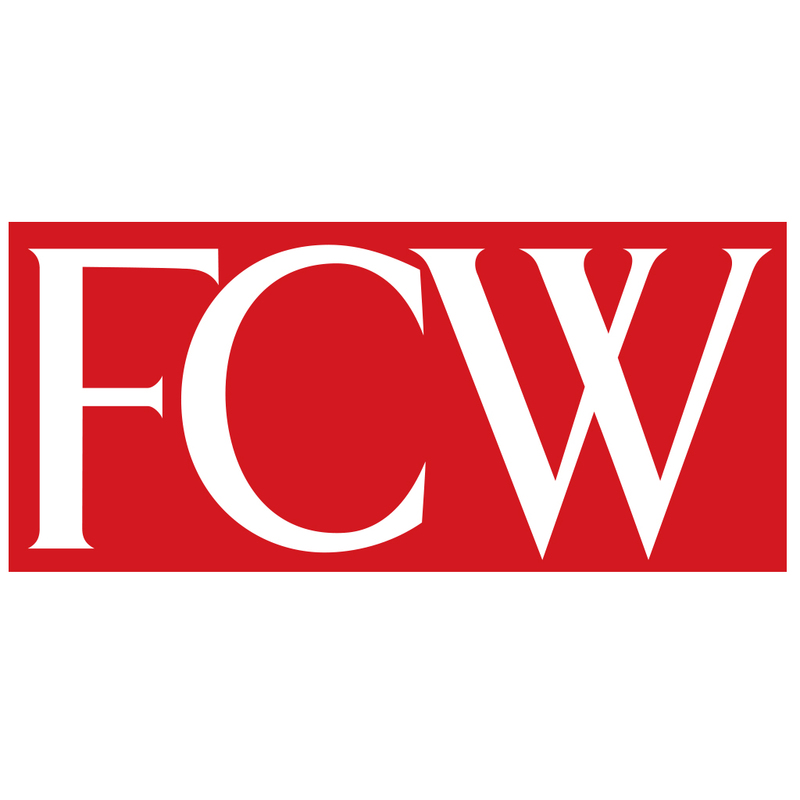 Mr. Martwinski was nominated for CXO – Smart CEO Magazine. Keith Nakasone, Deputy Assistant Commissioner, Acquisition Management, Office of Information Technology Category (ITC), Federal Acquisition Service, General Services Administration. The Federal Acquisition Service provides buying platforms and acquisition services to Federal, State and Local governments for a broad range of items from office supplies to motor vehicles to information technology and telecommunications products and services. As an organization within FAS, ITC provides access to a wide range of commercial and custom IT products, services and solutions. Kevin Youel Page, Co-Founder, Onetegrity LLC. Among those at the forefront of federal government acquisition reform for the last decade, is a co-founder of Onetegrity, an advisory firm dedicated to supporting leaders to achieve transformational results. He previously served as the Deputy Commissioner, FAS where he led delivery of more than $50 billion of products, services and solutions that accelerated federal mission delivery while saving taxpayers over $5 billion annually. He has served and led at Treasury, the World Bank, IBM Global Services, Touchstone Consulting and POGO. He earned a MBA from University of Michigan Business School and a BA from Tufts. Mike Palmer, Acquisition Strategist, Department of Homeland Security. Michael Palmer leads acquisition strategy activities at the Department of Homeland Security’s (DHS) Digital Service as they tackle digital transformation projects across DHS. In March 2016, Michael returned to DHS after an assignment to the United States Digital Service (USDS) Headquarters at the White House where he led acquisition and technology reform efforts across the government. Prior to his time with USDS, Michael led acquisition activities for DHS’s Office of Cybersecurity and Communications where he managed a portfolio of cybersecurity contracts valued over $1 billion. Previously at the Environmental Protection Agency (EPA), Michael led the planning and management of large-scale IT programs, primarily for EPA’s Office of Environmental Information, and he has also worked at GSA FEDSIM where he managed over $1 billion in government IT contracts. Michael has successful private sector experience in business development and project management roles. Michael has a B.S. in Mechanical Engineering from Clemson University, an MBA from George Mason University, a Project Management Professional (PMP) certification, and he plays striker for Uno Mas, a men’s soccer team in northern Virginia. Stacy Barley Riggs, Acting Director, Government-wide Category Management Program Management Office, Office of Enterprise Strategy Management Federal Acquisition Service, U.S. General Services Administration. Stacy Barley Riggs is the Acting Director of the Government-wide Category Management Program Management Office (PMO) in the Federal Acquisition Service’s Office of Enterprise Strategy Management (QP). 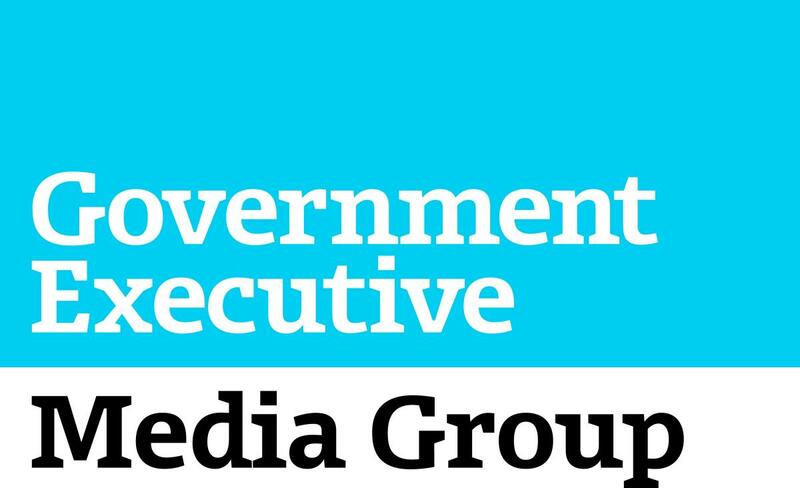 In this position, she leads the operations of the PMO that support the 10 category managers and their teams through data analytics, execution of initiatives defined in the category strategy plans and outreach and engagement with stakeholders, agencies and industry. Ms. Riggs has spent the majority of her 30 year career leading highly visible and cross-cutting initiatives in the Federal IT, acquisition and finance communities. She was previously the Associate CIO for Planning and Execution in GSA IT; the Executive Director of the Financial System Integration Office (FSIO) and the Financial Management Line of Business (FMLoB) and the Deputy Director for the Office of Information, Integrity and Access under GSA’s Office of Government-wide Policy and the Chief Financial Officer for the Federal Technology Service’s (FTS) Office of Assisted Acquisitions. In addition to her GSA roles, Ms. Riggs has been the CFO at the US Holocaust Memorial Museum and Commerce’s Economic Development Administration; the Chief of Staff to the USDA CIO; and the Deputy Associate CIO for the Office of Infrastructure Management and the Office of Policy and Planning, both within USDA’s Office of the CIO. Ms. Riggs holds a Bachelor’s degree in Business and Finance and a Masters of Business Administration. Throughout her career she has been very active in various roles in associations that support the Federal government to include the American Council for Technology and Industry Advisory Council (ACT-IAC), where she is currently serving as the government chair for the 2018 Voyagers Program; the Association for Federal Information Resource Management (AFFIRM); and the Association of Government Accountants (AGA). Lauren Schmidt, Senior Director, Pathways, Defense Innovation Unit Experimental (DIUx). Lauren Schmidt is the Senior Director, Pathways at the Defense Innovation Unit Experimental (DIUx), located in Mountain View, CA. In this position, she developed a first-of-its-kind rapid acquisition mechanism called the Commercial Solutions Opening (CSO), which leverages Other Transaction authorities to execute fast, flexible, and collaborative deals with top-tier technology companies across the country. As a result of her work, DIUx has deployed over $180M to over 60 companies over the past year in areas as diverse as machine learning, autonomy, and commercial space. Ms. Schmidt sets and manages the innovative acquisition strategy for DIUx, which aims to fundamentally change the way the Department of Defense does business. Using these new techniques, DIUx scouts, connects and supports the innovation of disruptive technology that sustains and extends U.S. strategic advantage in defense. Prior to her position at DIUx, Ms. Schmidt served as the Special Assistant to the Principal Deputy Assistant Secretary of the Army (Acquisition, Logistics, and Technology). In that capacity, she advised and supported the Principal Deputy across the full spectrum of policy and oversight matters concerning Army acquisition – including operations of a 6,000 person organization managing over 600 Army weapon systems programs and contracts totaling more than $70B. In this capacity, she helped develop and promulgate the Department’s acquisition reform proposals included in congressional legislation. She also previously served as the Special Assistant to the Deputy Assistant Secretary of the Army (Procurement), focusing on oversight of all Army procurement operations and the development of the Army contracting workforce. Ms. Schmidt holds a Master of Science in Commerce and a Bachelor of Arts, both from the University of Virginia. Alla Goldman Seiffert, Acting Director, and Assistant Commissioner, Office of Acquisition, Technology Transformation Service, General Services Administration. Alla Goldman Seiffert is the Acting Assistant Commissioner and Director of the GSA FAS Technology Transformation Services’s (TTS) Office of Acquisition - the sister office to 18F. Her goal is to make procurement joyful as her office works to spread modular contracting and agile software development through the Agile BPA and acquisition consulting projects with federal, state, and local governments. By background, Alla is a product manager, lawyer, and policy wonk. She’s a third generation public servant and a graduate of the U of A James E. Rogers College of Law. Jaclyn Smyth, Director, Department of Homeland Security Strategic Sourcing Program Office, Office of the Chief Procurement Officer. Jaclyn Smyth is the Director of the Department of Homeland Security (DHS) Strategic Sourcing Program Office (SSPO) within the Office of the Chief Procurement Officer (OCPO) where she oversees a portfolio of over 80 DHS-wide contract vehicles valued at more than $60 billion. She has several years of experience in Federal procurement and acquisition-related fields where she has worked on a wide variety of large-scale DHS-wide and Federal-wide procurements. Ms. Smyth is an active participant in the Federal-wide Category Management Leadership Council where she lends her expertise in sourcing strategies and category management. In February 2016, Ms. Smyth was named as the Government-wide Security and Protection Category Manager where she leads a cross-Agency Category Team and is responsible for developing and implementing government-wide strategies that align with established category management principles and methodologies. Prior to her Federal Career, Ms. Smyth served as a Principal with E3 Federal Solutions for several years during which time she consulted on DHS procurements. Ms. Smyth possesses an extensive background working with applied business and analytical disciplines supporting management operations for Private Industry as well as State and Federal Government. Her expertise includes program and project management, strategic sourcing, category management, and the formulation of acquisition and procurement strategies for an extensive range of commodities. Ms. Smyth has an expansive knowledge of Information Technology and Security requirements and trends within DHS, the Federal Government, and across Private Industry. Ms. Smyth holds a Master’s Degree in Business Administration from the George Washington University, and a Bachelor’s Degree in Business Management with a concentration in Political Science from Roger Williams University. Ms. Smyth was a co-author of an article published in the Fall 2005 Journal of Organizational Ethics: Healthcare, Business and Policy. She has received numerous awards for her professional efforts while at DHS including: the Federal 100 in 2017; the DHS Management Directorate Partner of the Year Award in 2014; the DHS Office of Small and Disadvantaged Business Utilization Cooperation Award in 2014; and the Multiple-Award in Government and Industry Conference (MAGIC) Small Business Engagement Award in 2013. Richard A. Spires, CEO, Resilient Network Systems, a San Francisco-based software firm that provides the Trust Network platform to bring trust to the cloud and the Internet of Things. Mr. Spires was appointed and served as the Department of Homeland Security’s (DHS) CIO from August 2009 till May 2013. Mr. Spires also served as the Vice-Chairman of the Federal Government CIO Council and the Co-Chairman of the Committee for National Security Systems (CNSS). From 2004 through 2008, Mr. Spires served as the IRS Deputy Commissioner for Operations Support and as the CIO, with responsibility for a $2 billion budget and a 7,000-person IT organization. Mr. Spires led the IRS’s Business Systems Modernization program, one of the most complex information technology modernization efforts undertaken. From 2000 through 2003, Mr. Spires served as President and COO of Mantas, Inc., a software company providing analytics solutions to the financial services industry. Mr. Spires also spent 16 years serving in a number of technical and managerial positions at SRA International. Mr. Spires received a B.S. in Electrical Engineering and a B.A. in Mathematical Sciences from the University of Cincinnati, and holds a M.S. in Electrical Engineering from the George Washington University. Mr. Spires received the 2012 Fed 100 Government Executive Eagle Award, TechAmerica’s 2012 Government Executive of the Year, Government Computer News 2011 Civilian Government Executive of the Year and was named a Distinguished Alumnus of the University of Cincinnati’s College of Engineering in 2006. Bob Vitelli, Branch Chief for Client Contract Operations, Federal Acquisition Service, General Services Administration. Bob Vitelli is the Branch Chief for Client Contract Operations, Branch B in the Acquisition Operations Division (AOD) supporting the General Services Administration’s Federal Acquisition Service (FAS). He has the responsibility of directing a staff of contracting officers and specialists who serve the acquisition needs of Assisted Acquisition Service (AAS) clients in the Mid-Atlantic Region. Bob also serves on the regional AAS Contract Management Review Board, the Contracting Officer Warrant Board, the Mid-Atlantic Acquisition Council and the MAAC Sub-committee on Best Practices. Bob is a GSA Meritorious Service Award winner. He is a FAC-C Level 3 Contracting Officer with an unlimited Warrant. Bob has over 30 years of experience with GSA contracting operations and is recognized for developing and executing acquisition streamlining techniques. Mr. Vitelli holds both B.S. and M.S. degrees in Public Administration from Shippensburg University of Pennsylvania. Trevor Wagner, Testing and Reengineering Lead, Procurement Innovation Lab (PIL), Office of the Chief Procurement Officer, Department of Homeland Security. Trevor began working for the Department of Homeland Security (DHS) in 2014, spending his first two years on DHS’s classified requirements transitioning to the Procurement Innovation Lab (PIL) under DHS’s Office of the Chief Procurement Officer (OCPO). In the PIL, Trevor works currently as the Testing and Reengineering Lead, helping DHS foster a culture of procurement innovation by testing new techniques and sharing those best practices with the DHS acquisition workforce and across other federal agencies/councils. Prior to DHS, he worked at a small staffing company in procurement/project control then at a large defense contractor as a corporate contract administrator. Traci Walker, Director of Digital Service Procurement, U.S. Digital Service. Traci joined the US Digital Service in October 2014, where she works to update procurement methods to capture the ever changing technology needs. Prior to joining USDS, she was a Senior Contracting Officer at the Executive Office of the President for 7 years, where she managed and awarded the EOP’s CIO and Office of Digital Strategy’s procurements. Most notably she awarded and managed the digital service contracts for WhiteHouse.gov web infrastructure and support services, the Presidential Correspondence System, and Staff Portal. Based on the work she has done in designing contracts to support agile development methods and the procurement of digital services, she was tasked to help OMB as one of the original collaborators and drafters of the TechFAR, which was launched along with the Digital Service Playbook as best practice guides. Now, as part of the USDS Procuremenati, she enjoys helping agencies conduct their own digital service acquisitions through initiatives such as the DITAP Training program, TechFARHub.cio.gov, and Digital Service Acquisition Principles. Bill Zielinski, Deputy Assistant Commissioner, Office of Information Technology Category, Federal Acquisition Service, General Services Administration. Bill Zielinski is the Deputy Assistant Commissioner, for the Office of Information Technology Category (ITC) in GSA’s Federal Acquisition Service (FAS). The Federal Acquisition Service provides buying platforms and acquisition services to Federal, State and Local governments for a broad range of items from office supplies to motor vehicles to information technology and telecommunications products and services. As an organization within FAS, ITC provides access to a wide range of commercial and custom IT products, services and solutions. Acquisition Excellence is an exceptional event designed to discover the latest developments and best practices on acquisition and get tangible strategies for procurement success. Expected attendance is 500 of which half are government employees. Please contact Carol Miller (703-208-4800 x256) or NicholeiJamero (703-208-4800 x205) to learn more about sponsorship and exhibit opportunities. Individuals who successfully complete this program are eligible to receive 6 Continuous Learning Points (CLPs). Individuals may obtain their CLPs by visiting the event registration desk at the end of the event or by sending an email request to training@actiac.org within one week after the event. Contact khemphill@actiac.org for information about the education credits available for this event. For further information on CLP credits, please visit https://www.actiac.org/learning/continuing-education-units-ceus/continuing-education-units-ceus. The American Council for Technology-Industry Advisory Council (ACT-IAC) has been accredited as an Authorized Provider by the International Association for Continuing Education and Training (IACET). In obtaining this accreditation, ACT-IAC has demonstrated that it complies with the ANSI/IACET Standard which is recognized internationally as a standard of good practice. As a result of their Authorized Provider status, ACT-IAC is authorized to offer IACET CEUs for its programs that qualify under the ANSI/IACET Standard. As an IACET Authorized Provider, ACT-IAC offers CEUs for its programs that qualify under the ANSI/IACET Standard. ACT-IAC is authorized by IACET to offer .6 CEUs for all attendees that successfully complete the required materials. To be eligible for CEU Credit, a survey asking about the outcomes of the event must be completed. The survey must be completed in its entirety within 5 business days of the close of the event. After that time the survey will be closed. ACT-IAC has been accredited as an Authorized Provider by the International Association for Continuing Education and Training (IACET).